Just over 25-years ago, Iran “The Blade” Barkley, he of the mean streets of The Bronx, met Thomas “The Hitman” Hearns, he of the equally tough neighbourhoods of Detroit – and a sensational middleweight title fight was witnessed. Hearns, by 1988 already a living legend, has just made history by becoming the first ever four-time “world” champion in boxing (welterweight, light-middle, light-heavy and then middleweight). Barkley, who had been handily out-pointed by the talented Sumbu Kalambay in his only other world title challenge, was a pretty big underdog entering the ring at The Las Vegas Hilton that summer’s evening. Still, sage boxing people knew Barkley was as tough as he was dangerous. To the shock of millions, Barkley showed just how tough and dangerous he was, after taking a most ferocious beating at the hands of the champion. Famously declaring on air that he “didn’t have time to bleed,” Barkley, busted up and looking ready for the taking, had just minutes earlier returned fire in a savage 3rd-round and sent Hearns crashing. But what are Barkley’s memories of his greatest win today? Q: As you know, Champ, it’s just over a quarter of a century ago when you scored The Ring Magazine “upset of the year” by KO’ing the great Tommy Hearns in the 3rd-round in Las Vegas in June of 1988. What are your memories of that fight all these years later? Iran Barkley: (laughs) you know, to me, that was the most exciting day in the world for me. I did what I needed to do in that fight. Q: You remember the fight well, Iran? I.B: Oh, yeah – it was June 6th, 1988! But Bob Arum saw to it that I never got the glory, the money, the respect that I wanted after that fight. Q: What do you mean by that, Iran? I.B: Well, he didn’t pay me right. He gave me so-called championship money; maybe half a million. He [Arum] thought that was enough for me. After I beat Tommy, I thought I’d be fighting Sugar Ray Leonard for $5million, or $10million. But Arum pretty much threw me in there with [Roberto] Duran for half-a-mil. Q: And the fight with Duran was great. You think you won that one? I.B: Of course, but they gave him [Duran] the decision. Q: You went on the Arsenio Hall Show ahead of the return with Hearns. What are your memories of that, Champ? I.B: Good memories, good memories. Tommy tried to show off, but I told him that this time I’d take him the 12-rounds and beat him up. I was always humble, and I never got the respect or the money I deserved. Q: Well, you have respect from this end, Iran! Have you still got the three world title belts you won – the WBC, IBF and WBA? I.B: Nah, I got rid of ‘em. I sold ‘em (laughs). But I never even got the WBA belt. I was in hospital after that fight (the light-heavyweight return with Hearns, in 1992 – Barkley WS12) and nobody went and got the belt for me. Nobody sent it to me. I kind of got bitter about boxing around that time. And even if you say I got respect today, respect don’t pay the bills. Q: Do you ever sit back and watch your great fights on tape today, Iran? I.B: I don’t watch ‘em, I don’t look at ‘em. Like I say, I’m pretty bitter about boxing today. But forget the Hearns fight; I had much tougher fights before that. On my way up I met [Marvin] Hagler’s brother, Robbie Sims, that was a great fight. And (later on, in 1997) I knocked out [Gerrie] Coetzee, they never gave me credit for that, even though it was at heavyweight. Q: When were you at your peak, Iran – for which fights were you at your best? I.B: When was I at my peak? At all times! Q: And of the three world titles you won – at middleweight, super-middleweight and light-heavyweight – which title means the most to you? I.B: All of ’em! Because I fought for all of ’em and I won them all. 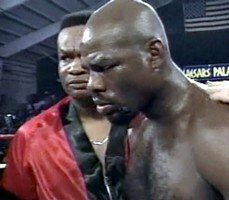 Iran Barkley may not say too much these days, but no fan who realises he owes him a debt of gratitude for the brutal and always entertaining fights he provided in the centre of the ring will ever, ever forget his bravery and guts. Barkley ruled as champion from June of 1988 to February of 1989. And from January of 1992 to February of 1993 (at 168 and 175-pounds).